The AceQ Universal U+ Probe Master Mix V2 (Vazyme, #Q513) is a probe-based reagent for qPCR. 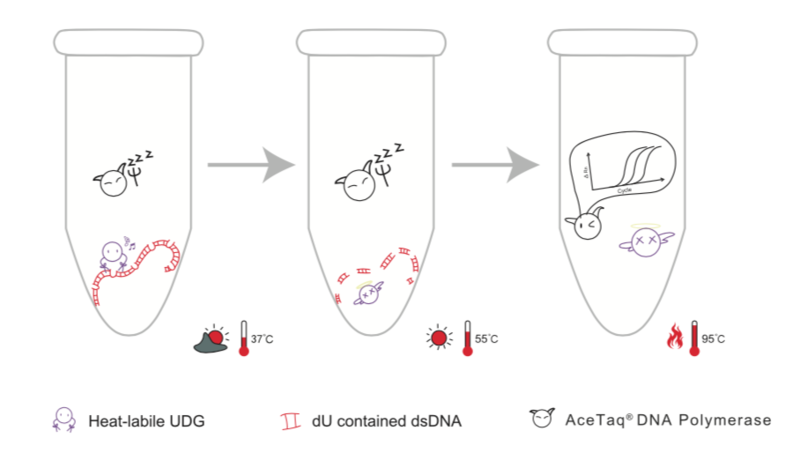 The core component AceTaq DNA Polymerase is a chemically modified hot-start DNA polymerase, combined with optimized buffer for qPCR, it can effectively inhibit non-specific amplification, and significantly improve the expansion efficiency and is suitable for high-sensitivity qPCR reactions. The dUTP/UDG anti-pollution system was introduced to the mix to eliminate the influence of the product contamination on qPCR. The mix, prepared at 2 × reaction concentration, can be directly used for robust and low-template quantitative PCR with high sensitivity, specificity and reliability. The ROX Passive Reference Dye included in this kit is a unique dye which makes this Mix applicable to all qPCR instruments, with no need to adjust the Rox concentration for different instruments. Unique chemically-modified hot-start taq, with unique specificity-promoting factors. Click the button below to add the AceQ U+ Universal Probe Master Mix V2 | Q513 to your wish list.